For President Obama, Election 2012 is looking more encouraging as a choice than as a referendum. In the latest Allstate/National Journal Heartland Monitor Poll, assessments of Obama's performance and agenda remain equivocal at best, especially among whites. But the survey finds Obama lapping Mitt Romney in several key comparisons, particularly those relating to empathy. Buoyed by those comparisons, Obama has opened a solid 50 percent to 43 percent lead over the Republican nominee among likely voters in the ballot test for November, the poll found. Obama drew support from 78 percent of minorities and 41 percent of whites, each down only slightly from 2008. The latest poll surveyed 1,000 adults for the entire questionnaire by landline and cell phone from Sept. 15 to 19; it also polled another 250 adults to generate a sample of 1,055 likely voters. The margin of error is 3.1 percentage points for the first group and 3 points for the second. The survey asked Americans to rank Obama and Romney on seven traits or characteristics; the president led or tied on each one. Romney ran even with Obama on striking "the right balance" on deficit reduction. Likewise, those polled divided about evenly on which candidate has "the experience and skills" to improve the economy. But even that equal split on managing the economy, which mirrors other recent national results, represents a gain for Obama, who trailed on this critical measure in May's Heartland Monitor Poll. 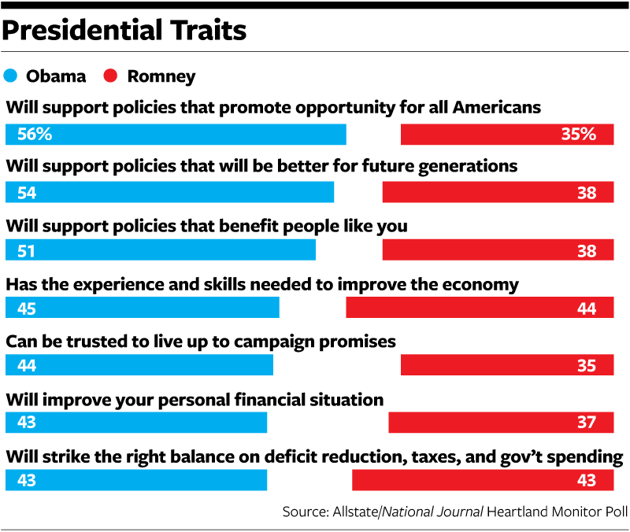 And on each of the other five traits measured, Obama topped Romney. The president held single-digit leads when respondents were asked who was more likely to improve their financial situation or to keep his campaign promises. Obama did best on three questions relating to empathy, with respondents providing him double-digit advantages on supporting policies that would benefit people like them, help future generations, and promote opportunity for all Americans. Most of these comparisons evinced a sharp racial divide. Among whites, Romney held a double-digit advantage on the economy, dealing with the deficit, and improving their personal financial situation; Obama ran even (or better) on those issues overall, because in each case at least two-thirds of minorities preferred him. On the questions relating to empathy, though, the president narrowly led among whites on providing opportunity for all, and he trailed only slightly on creating opportunity for future generations and formulating policies that will benefit people like you. On all three questions, at least 73 percent of minorities preferred Obama. On questions about Obama's performance, though, judgments remained considerably more mixed. Just 36 percent said that the Obama administration's actions will increase their opportunities to get ahead; an equal number said that the president's actions will decrease their opportunities. This is the first time in the 10 times the poll has asked that question since January 2010 that positive responses have even equaled negative ones, but it remains a less than ringing endorsement. Not since January 2010 have even 30 percent of whites said Obama's agenda will increase their opportunities; just 28 percent of whites said so in the latest survey. By contrast, the share of minorities who said Obama's agenda will widen their opportunities jumped to 62 percent, the highest level ever recorded in the poll. Respondents divided along similar lines on the overall impact of Obama's economic agenda: 46 percent said his policies did "help avoid an even worse economic crisis and are laying the foundation for our eventual economic recovery," while 44 percent said he has "run up a record federal deficit while failing to end the recession or slow the record pace of job losses. " That's virtually unchanged from this spring. Once again, the close overall result reveals a racial chasm: While 64 percent of minorities said his agenda has had positive effects, only 40 percent of whites agreed. Judgment on Obama's overall job performance wasn't much different: 49 percent approved, while 45 percent disapproved — only slightly improved from May. Again, the racial gap is enormous; Obama's approval rating among whites (39 percent) was about half his showing among nonwhites (76 percent). Likely voters reached an almost identical verdict, with 50 percent approving and 46 percent disapproving. As always with an incumbent, judgments on Obama's performance strongly correlate with preferences in his reelection: 93 percent of likely voters who approved of the president's performance said they intend to vote for him, while 87 percent of those who disapproved prefer Romney. But the poll strongly suggests that for now, an important slice of voters who are ambivalent about Obama are giving him the benefit of the doubt against Romney. The survey, for instance, found likely voters divided almost exactly in thirds on the famous Ronald Reagan question Republicans highlighted at their Tampa convention: 31 percent said they are better off than four years ago, 34 percent said they are worse off, and 34 percent said their condition is unchanged. But Romney led in the ballot test only among the third who say they are worse off: The president not only led by almost 10-to-1 among those who say they are better off, but he had a nearly 3-2 advantage among those who say their condition hasn't changed. That lead reflects another finding: By a 48 percent to 41 percent plurality, likely voters said the country is better off because Obama, rather than another candidate, won in 2008. Similarly, two-fifths of likely voters said the country is already significantly worse off because of Obama's policies; nearly nine in 10 of them are backing Romney in November. Only one in six said the country is already better off because of Obama's actions; he draws over nine in 10 of them. But another 41 percent said that while the president's policies have not yet produced significant benefits, they are moving the country in the right direction — and four-fifths of them prefer Obama over Romney. In other words, Romney is leading only among those who express unequivocal dissatisfaction with Obama's impact, just as the Republican leads only among those who say they are flatly worse off than in 2008. On both questions, those offering qualified verdicts on Obama's four years provided him strong margins over the Republican. Both results reinforce the sense that Obama's advantage in this race rests on voters who aren't fully satisfied with his first term but remain unconvinced that Romney offers a better direction.